Almost 700 students are expected to attend the 2016 Region 1 Health Occupations Students of America (HOSA) Leadership Conference hosted by Pensacola State College from 9 a.m. to 2 p.m., Friday, Oct. 21. Held at the WSRE Jean and Paul Amos Performance Studio, Building 23, on the Pensacola campus, the HOSA Conference attracts schools and colleges from Pensacola to Panama City. 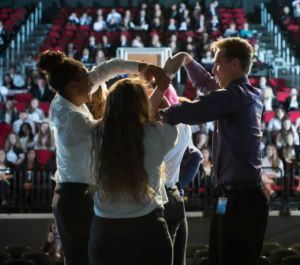 Students from 19 high schools, two middle schools and two colleges participate in demonstrations and activities such as HOSA Bowl, Forensic Medicine and election of officers. On hand to welcome students are District School Superintendents Malcolm Thomas and Tim Wyrosdick from Escambia and Santa Rosa Counties, respectively, and PSC Warrington campus dean Dusti Sluder. Highlighting the conference is a motivational presentation by Meghan McCarthy, director of Community Health and Wellness, Baptist Health Care. Jennifer Ponson, Region 1 HOSA advisor, points to the event’s exponential growth since Pensacola State began hosting HOSA conferences in 1997. “The first year, we had about 75 students attending from four high schools and PSC,” said Ponson who also serves as the Student Program and Outreach coordinator at Pensacola State. HOSA is a national student organization that provides a unique program of leadership development, motivation and recognition for students interested in health care careers.